This thread contains general information about the AOR GT3 Leagues on all platforms (XB1, PS4 and PC), such as league structure, assist restrictions and lobby settings. ● League setup: The leagues are tiered, with the aim to have faster drivers in the higher leagues and the slower drivers in the lower leagues. For season 1, driver placements will be based on a time trial event. Each tier contains one league. The amount of tiers/leagues each platform runs depends on the amount of drivers signing up at the start of the season. All of the tiers will be running the GT3 cars. All leagues have fixed promotion & relegation spots which come into effect at the end of the season, based on drivers' finishing positions in the championship. Ideal scenario: The top 4 finishers from each league will be guaranteed a move to the league above, and the bottom 4 will be guaranteed a move to the league below. Whether it will be possible to fully adhere to this system will depend on how many of the league drivers carry over to the following season. The AOR leagues favour drivers who race without assists enabled. You need to be able to drive without Traction Control and ABS in order to race in our GT3 leagues. The cars should be easy enough to drive without. Note: Racing Line is allowed in all tiers only because there is no lobby setting to restrict it. 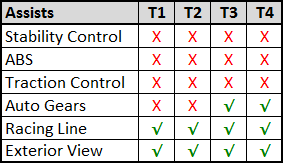 The following lobby settings will be used for the GT3 league races. *We will be keeping it simple with the weather and race time for the first season, however we aim to include dynamic weather and potentially sunset/night races for future seasons. **With the game currently quite unstable with regards to game crashes and disconnections, we feel adding mechanical failures would unnecessarily increase the chances of drivers having their races end through no fault of their own. This setting may be turned on for future seasons however. ***We feel the in-game penalty system is currently too inconsistent when enforcing the track limits. Bugs have also been reported of drivers receiving ridiculously excessive time penalties. Therefore we will be relying on our manual stewards panel to deal with any incidents for now. The following cars are available for selection in our GT3 leagues. *Note that the BMW M3 GT and Ginetta G55 GT3 have been reported as being off the pace compared to the rest of the cars, so these must be picked at your own risk. At the start of the season, after the leagues and driver placements have been announced, a thread will be opened within each league's subforum where car selection will take place. Drivers will be selecting their cars in order based on their combined lap times from the time trial event. Each car can be selected by a maximum of 4 drivers (6 on PC due to the bigger grids). Drivers who select the same car will be classed as "teammates" in the Manufacturer Championship. After the car selection process has finished, drivers are locked in their car for the full season. Mid-season car changes will not be possible. As teams are created based on manufacturer rather than livery used, drivers are free to use whichever livery they want during the league races. In each race, the manufacturers will score points based on the finishing positions of their top two drivers in the race. This means manufacturers with 2 drivers are not at a disadvantage compared to manufacturers with 3 or 4 drivers. Example 1: If McLaren has 3 drivers who finish 1st, 2nd and 3rd in a race, only the points for 1st and 2nd will count towards the Manufacturer Championship. Example 2: If Audi has 4 drivers who finish 4th, 7th, 9th and 12th in a race, only the points for 4th and 7th will count towards the Manufacturer Championship. Example 3: If Aston Martin has 2 drivers who finish 5th and 10th in a race, both drivers' points will count towards the Manufacturer Championship. ● If a driver loses connection during qualifying, they will be invited back into the lobby to continue from where they left off. ● If a driver loses connection during the race, that is tough luck, and unfortunately nothing can be done about that. ● We do our best to ensure that the best available connection in the lobby acts as the lobby host, so any connection issues are normally a result of a fault on the disconnecting driver's end. Please ensure that your internet connection is fine, and that your NAT type is open, before entering the race lobby. ● If 4 (or more) drivers lose connection to the lobby during the transition from qualifying to the race, the lobby will be restarted and the race will be started with a manual rolling start, where drivers will use the first lap of the race to line up in a double file formation based their qualifying positions. Proper concentration and cooperation from the drivers are required to make this work. ● During the race, if half (or more) of the drivers in a race lose connection at the same time, or over a short period of time, that counts as a mass disconnection.